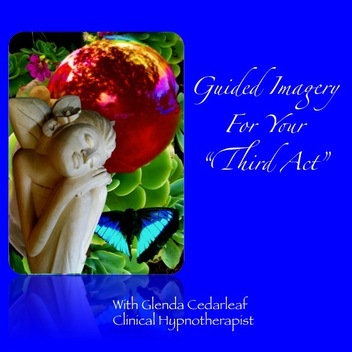 Are you ready to look deeper into your soul for the unique answers of your life in the "Third Act"
There are 4 guided imagery exercises are designed to be your companion on this journey of self exploration. These journeys are inspired by our women's retreats. Third Act "Intro" invites you into this powerful process and prepares you for the journey ahead. "Intention" helps you connect at a visceral level, with the process of setting an intention in our life. guided into a place where you truly feel their energy and receive their guidance. "Envisioning" guides you through a comprehensive exercise in seeing yourself through the lens of the Third Act--helping you clarify your calling and purpose in life. These audios are all inspired by our Third Act retreats. Do you want to move towards new visions for yourself and find a renewed sense of purpose? Are you seeking clarity for your second half of life? Are you wanting to finish unfinished business? Have you had a life altering experience and now feel drawn to releasing old roles and exploring a new path? The "Third Act" of life--offers us ways to recreate ourselves as we move forward into this "unchartered" territory.